In this work by Max Hayslette "Tuscan Gold" we see a series of Tuscan villas in the hilly countryside. The works of Hayslette reflects his love of Tuscan and Italian landscapes, and his works evokes the beautiful light that is seen in the afternoons in this region of central Italy. Tuscany is well known and loved for its produce of wine and cheese as well as its landscapes which are filled with poplar trees and hills bathed in a gentle climate, which are shown here by the gemtle and golden hues used. 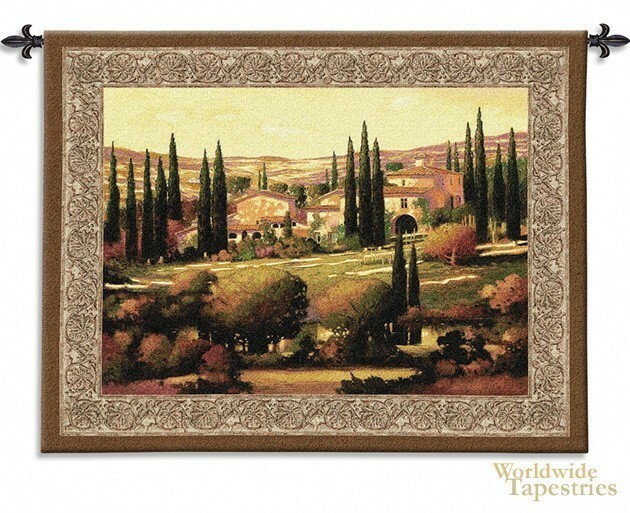 This landscape tapestry "Tuscan Gold" is backed with a lining and has a tunnel for easy hanging. Note: tapestry rods and tassels, where pictured, are not included in the price. Dimensions: W 53" x H 40"